As all of you know the official Sopcast client for linux is only the command line version and many people find it difficult to use the CLI version. However, many good people have made an effort to write the graphical frontends to the Sopcast client for linux. Here you will find some of such GUI frontends for sopcast. Sopcast Player: SopCast Player is designed to be an easy to use Linux GUI front-end for the p2p streaming technology developed by SopCast. SopCast Player features an integrated video player, a channel guide, and bookmarks. Once SopCast Player is installed it simply "just works" with no required configuration. qsopcast: qsopcast is a QT GUI front-end of the Linux command line executive of P2P TV sopcast. gsopcast: gsopcast is a GTK based GUI front-end for p2p TV sopcast. TV-Maxe: TV-MAXE is an application which provides the ability to watch TV stations and listen radio via different streams, such is SopCast. Currently it has a large number of channels, both romanian and international. SCPlayer: SCPlayer is a simple and lightweight GUI frontend for sopcast supporting only linux GNOME3 platform. Pysopcast: It is a simple GUI for sopcast made using PyGTK. totem-sopcast: A totem plugin to let you browse and play sopcast streams. wxsopcast: A sopcast GUI for linux written in python and wxPython. 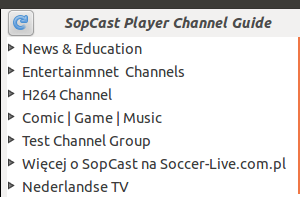 Note that the channel URL needs to be changed to http://www.sopcast.com/gchlxml at first. jsopcast: jsopcast is a simple GUI to see P2P TV sopcast made in Java. SopCast is a simple, free way to broadcast video and audio or watch the video and listen to radio on the Internet. Adopting P2P(Peer-to-Peer) technology, It is very efficient and easy to use. The GUI for sopcast player for linux works pretty well and this post gives you the step by step process of installation of sopcast player in linux.